Love maps? 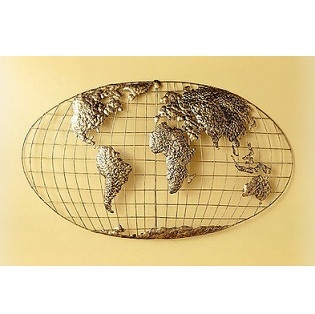 I do and this metal world map wall sculpture is something to behold. It combines decorative art with cartography and the result is every geography lover’s dream. The Poole world map wall sculpture is made from a mixture of iron and metal, and features all the recognisable land masses and coastlines one would expect to see. A grid structure represents the seas and oceans, whilst the curve of the globe is also highlighted. The metal world map sculpture has been completed with a brushed gold finish to create a certain sparkle. It’s perfect for map lovers of all ages and can be placed in a kid’s bedroom, an adult’s study, a hallway, or even in the main living room or dining room. What’s certain is that the wall sculpture will complement existing map themed décor wonderfully well and will likely create itchy feet for those with a propensity for travel and exploration. You can buy it from here: Poole World Map Wall Sculpture. See the many positive reviews for further information. Maps in the home are normally associated with atlases, children’s world globes and perhaps a poster on a teenager’s bedroom wall. However, this map of the world silhouette pillow cushion combines the joy of maps with soft furnishings to create an appealing decorative accessory for a sofa, bench or bed. It features the entire world from the Americas on one side to Australia and New Zealand on the other. Its length makes it perfect for reclining furniture as well. If you are anything like me, maps will be an important part of your life. For as long as I can remember I’ve had a fascination with maps and all things related to them. The long winding rivers, arching mountain ranges, vast seas and the countless cities, towns and villages that make up the average map held my interest for countless hours when a child. Now in adulthood, the image of a world map, atlas or globe sends my heart beating a little bit faster and it’s all I can do to stop myself from purchasing a map related book, poster or decorative item each and every time I see one. You’re bound to know someone like me with an interest in maps and cartography (map-making). If you or someone you knows is map-mad then this map of the world silhouette pillow cushion will make an excellent addition to their home. The land masses are in black whilst the seas are left white. Black and white soft furnishings can blend in well with numerous styles of furniture and décor schemes. The pillow can take a prime position in a living room or, maybe better still, in a bedroom or study area, especially for someone with a career connected to maps and travel. 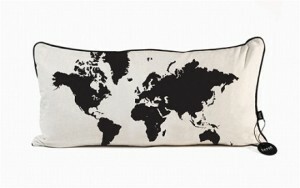 You can buy the pillow cushion from here: World Map Pillow in Black by Ferm Living. If you’re anything like me, you like to keep to the wine bottle corks of fine wines you’ve recently enjoyed as a memento of the delicious taste, the setting and of course, the name of the wine if it is printed on the cork itself. This “Corks of the World” cork cage is an ideal storage container and is a sculptural marvel in its own right. For anyone with a love of wine, travel, cartography or geography, this unique cork container will make the most wonderful addition to the home. A globe of the world cork cage does indeed combine well with the subject of wine. Connoisseurs of wine will be well aware of the multitude of different locations from which the wine we find in your local stores come from. They range from California, Chile and Australia through to France, Italy, Israel and South Africa. In Europe especially, wine regions have developed over many centuries and give their name to some of the most famous and delicious wines we know today. This cork cage is based on the traditional spinning globe that can be seen in bedrooms, schools and libraries across the nation. However, it has a decidedly classical metal style and is based on the traditional world globes seen in the 17th and 18th Centuries. The globe cage section does indeed spin so as to move the corks about to catch a glimpse of the corks you’ve collected when showing friends and guests your previous buys. A little round hole provides the access point. Place it on a home bar table or shelf and it will merge in with the general theme of the interior very well. Alternatively, it can also be situated in a wine cellar, kitchen, dining room or living room where it will be sure to enhance the overall décor of the space. 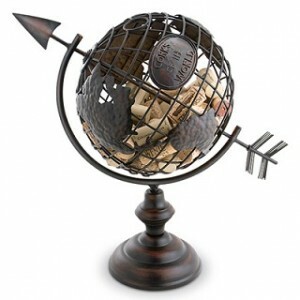 The cork cage globe is going to fit in wonderfully with décor themes connected to wine, travel, culture and the world at large. You can buy it from here: Corks of The World Cork Cage. Made from pure cotton, this Around the World kids bedding set is a sure way to entice your small child into appreciating the wonders of the world. I remember when I was a little one, I’d pour over maps for hours on end, looking at the various countries, mountain ranges, cities and seas wondering who lived where and what scenery each place presented. This was most definitely inspired by the map books and kid’s decorative accessories my parents bought me. 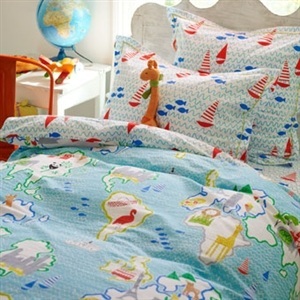 You can also plant the seeds of learning in your child’s mind with this fun and aesthetically beautiful bedding set. Included in the set is a twin duvet cover, fitted sheet and a pillow case. There are optional extras in regards to the type of pillowcase you desire. On the top of the duvet cover there is represented a blue sea with the major continents of the world included. On each continent are a few images portraying the famous landmarks, animals and geographical features that are well-known to that particular part of the world. For example, a panda sits in China; the Eiffel Tower stands tall over Western Europe; and what looks like a cityscape can be seen covering North America. On the reverse is a complimenting print of waves boats and fish design which matches with the pillowcases. The bedding set is wonderfully charming and visually relaxing as well as being a great first step in your child’s interest in the wider world. It will be particularly suitable for a geography themed kid’s bedroom and will compliment bedside globe lamps, map wallpaper, flag décor and images of animals and places from different continents. I know for sure that I would have loved this map of the world bedding set as a child. You can buy it from here: Around the World Kid’s Bedding Set. Designed by the London-based design team ‘Designers Guild’.